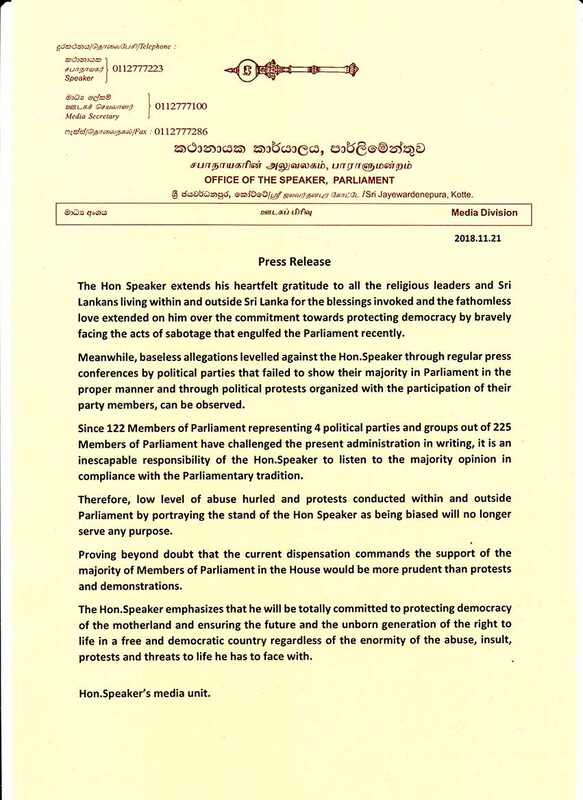 (Lanka e News - 21.Nov.2018, 6.00PM) The Hon Speaker extends his heartfelt gratitude to all the religious leaders and Sri Lankans living within and outside Sri Lanka for the blessings invoked and the fathomless love extended on him over the commitment towards protecting democracy by bravely facing the acts of sabotage that engulfed the Parliament recently. Meanwhile, baseless allegations levelled against the Hon.Speaker through regular press conferences by political parties that failed to show their majority in Parliament in the proper manner and through political protests organized with the participation of their party members, can be observed. Since 122 Members of Parliament representing 4 political parties and groups out of 225 Members of Parliament have challenged the present administration in writing, it is an inescapable responsibility of the Hon.Speaker to listen to the majority opinion in compliance with the Parliamentary tradition. Therefore, low level of abuse hurled and protests conducted within and outside Parliament by portraying the stand of the Hon Speaker as being biased will no longer serve any purpose. Proving beyond doubt that the current dispensation commands the support of the majority of Members of Parliament in the House would be more prudent than protests and demonstrations. The Hon.Speaker emphasizes that he will be totally committed to protecting democracy of the motherland and ensuring the future and the unborn generation of the right to life in a free and democratic country regardless of the enormity of the abuse, insult, protests and threats to life he has to face with.